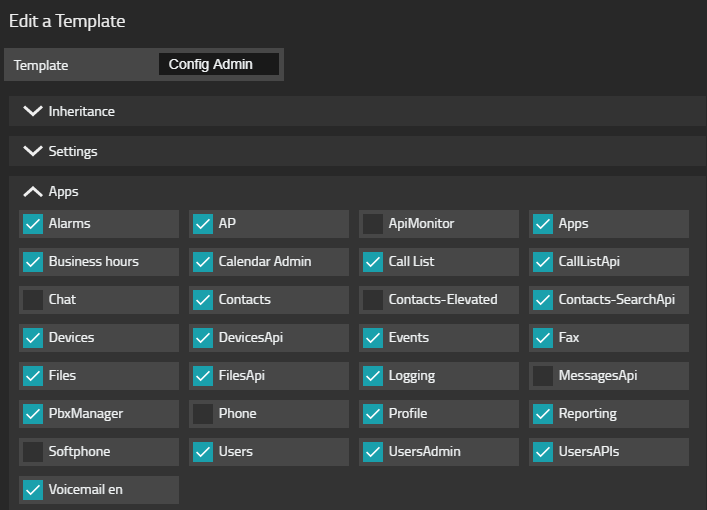 3 The Templates PbxManager Plugin (contd). There are a lot of settings for users and we will see a number of them in this course. For now, it is good enough to understand that such settings can be put in a so-called template. 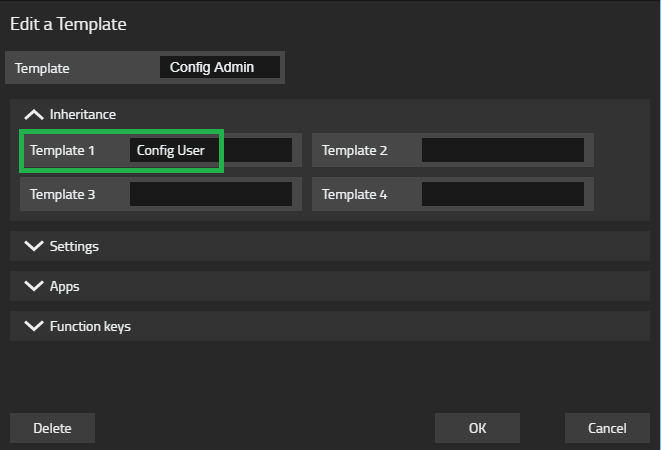 You can then assign a template to a user and the settings in the template will be applied to the user. Also, when you change the template later on, the change will be effective for all users who have the template assigned. Now its the time to look at these templates in more detail. The tool to do this is the Templates PbxManager plugin . When you open it, it will list the aforementioned templates Config User and Config Admin. Let's see what is in a template. The Apps part of a template define the Apps that are technically available to users who share this template. Technically here means that the App will be listed in the respective users list of all Apps. To really be able to use it, licenses may be required and assigned to the user (depending on the App). This is not done here. As mentioned before, Install has created the two templates Config User and Config Admin. The App assignments in Config User list all the end-user Apps while the App assignments in Config Admin list the administrative Apps. Others however are provided by the PBX (such as for example the PbxManager) and therefore "just exist" because the PBX exists. Again others exist because specific objects exist in the PBX. We have used Time Switches before and also the App that allows end users manage the state of the time switch. In our case, it was called Business hours. In fact, the PBX will create a separate App for each time switch you create and the name of the App is the name of the time switch. One interesting but non-obvious type of Apps is those that end with ...Api. These are not Apps with a user interface. Instead, they are APIs exposed by an App that allow other Apps to use their services. For example, when the Waiting Queue PbxManager plugin tries to find the announcement files you have stored in the Files App, it uses the FilesApi which lists all stored and shared files. For an App that uses services (that is, an API) of another App to work, the user that runs the App must have access to the respective Api. Don't forget to fix the template again! 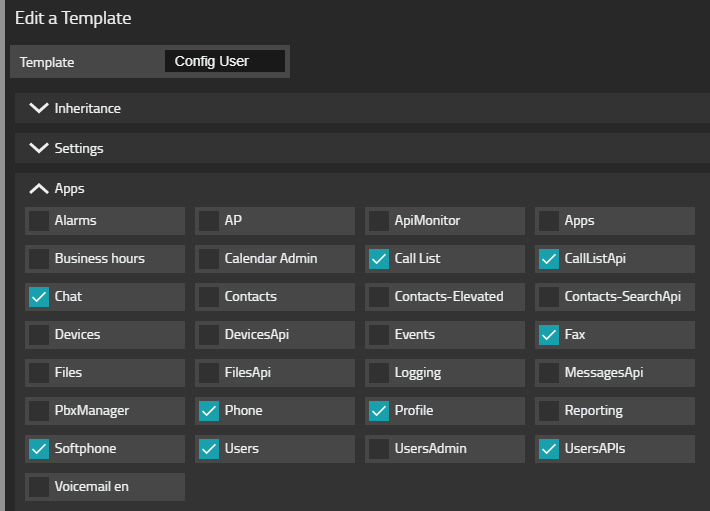 You might have asked yourself when looking at the Apps settings in the Config Admin and Config User templates: why are the end-user Apps not ticked in the Config Admin template? Does that mean that administrators must not use end-user Apps? The answer is: not at all. The trick here is that templates can inherit from other templates. In our case, Config Admin inherits from Config User. This is defined in the Inheritance section of the template settings. A template can inherit settings from up to 4 other templates. However, inheritance is not recursive. In other words, if template A inherits from template B and template B inherits from template C, A does not inherit from C (but still, B inherits from C). So if a user has template A assigned, the settings from both A and B are effective, but not C. If a user has template B assigned, the settings from both B and C are effective. So if you want a user to receive settings from A, B and C, you must list B and C in the Inheritance section of A and assign A as the user's template. The inheritance logic is quite simple: when a template inherits from another and a value is empty in the inheriting template, the value from the inherited value takes effect. This section allows you to setup the two most basic types of function keys on your phones: Quickdial and Partner. Function key can be defined in a template and their definition is independent of the actual phone model the user has. Nevertheless, different phone models may have different number and layout of function keys. For example, IP2x2 models may have an extension module installed which offers two additional pages with 16 function keys each. Some older phones however had less function keys. For example, the IP240 had 15 function keys (and also an optional extension module) and the IP110 had only 4.
so that it is easier for you to determine on which position it is displayed on a real phone. The Quickdial key is usually used for external numbers. For internal numbers, the Partner key is often more popular as it provides a bit more functionality. using the new function key. The Partner key is something like an enhanced Quickdial key. It has the same properties (Label and Destination) but it offers slightly more functionality. : as soon as you have taken Lisa's call, Jean's phone will show the On the phone note for invalid member reference '.firstname' in 'firstname' (>invalid member reference '.username' in 'username' On the phone). This is because a Partner function key can subscribe to the call information of the target user. As a rule of thumb, you should use the Partner key for real target users in your PBX where it is useful to see their status. For functional numbers (a waiting queue or a voicemail for example) and for external users, you should use a Quickdial key rather. To get the Pickup to work, we first need to look a the concept of Privacy. This is done in the next chapter. The amount of information that is available to other users is controlled by the users themselves. There is a Privacy tab in the user's profile settings that allows you to define who has access to which part of your call and presence information. in your profile, you see the respective settings under the List of templates privacy filters heading. This is because they are done in one of your templates (its actually part of the Config User template). You can not change these settings directly (as you can not change a template in your own profile editor). But you can create your own settings that override the default ones. When you add your own privacy filters, it will take precedence over one that was defined in a template. Note that privacy rights are asymmetrical. The fact that user A has access to information about user B does not imply that user B has access to the same information about user A. Instead, both user A and B need to grant access to their own information (using their own profile, or the administrator does it using templates). of Jean and Mario. When your phone is ringing, Jean's phone does not change while Mario's phone shows the alerting call. Only when you take the call, Jean's phone shows that you are On the phone. If you also tick the Calls with Number check-mark in your privacy filter for Mario, he would even see who calls you . this is shown for both Mario and Jean because the default privacy settings allow access to Presence and Presence note for all users of the PBX (as discussed above). When you play around with privacy settings and a phone does not behave as expected, simply do a power cycle on the phone. This is the fastest method to refresh the subscription a phone establishes to the PBX to receive the call and presence information. 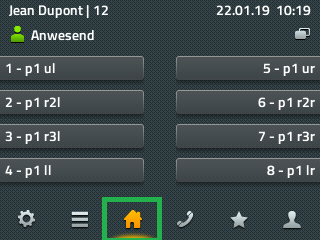 When a user receives call information (that is, Calls (or Calls with Number) information) in a subscription made by a function key, the key will show the calls. This is also true for alerting calls .
. In this state, the user of the function key can decide to either take the call (this is known as Call pickup) or to reject it. Note that rejecting the call does not cancel the incoming call for the target user. Instead, it continues to ring on the target phone. The Templates PbxManager Plugin (contd). The Pickup function key also allows users to do call pickup. However, instead of subscribing to the call information for a specific target user it subscribes to the call information for all users in a group. Therefore you would - in addition to the Label - configure the name of a group in the Group field. For a Pickup key to receive Calls with Number information required to perform a call pickup, the user must have appropriate access rights. In contrast to the Partner key, privacy control is not done using the privacy settings in a user's profile (nor using the privacy settings in the templates). Instead, users have access to other user's call information if they are active member of a group in which the monitored user is also a member (not necessarily an active member). So like with the privacy settings, access to calls information is asymmetric. If user A is an active member of group G and user B is a non-active user of G, then A receives information about B but B does not receive information about A. If both are active members of G, they mutually have access to their call information. The active property of a group membership can not be set by the user. Instead, it must be set by the administrator using the Groups PbxManager plugin. As a result, users can not accidentally change the function of a Pickup function key. Dynamic membership (dynamic-in or dynamic-out) is irrelevant to group pickup. That is, a user's call information can be seen by other active group members even if the user currently has the dynamic-out group membership state. on Jean's phone. If you press the key, the call will be available for call pickup just like with the Partner key before. Calls that can be picked are shown in the Pickup key but they are not alerting on the monitoring phone of course. However, as the Signal after ... (s) property is set (as a time in seconds), an audible signal is heard on the monitoring phone after the specified time. If you did not notice it, call again to Mario and let the call ring. After 2 seconds, you will hear the attention tone. Use of Call Waiting often is part of the companies phone policies. 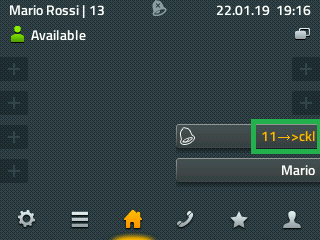 If it is ticked in the template, calls received during another call will be shown on the phone display (which is the default which is why it is already ticked in a new template). Also, a tone is inserted into the active call so to attract the user's attention. If it is not ticked, such calls will be rejected with a user busy cause. When the phone features an LED (and your IP232, IP222, IP112 and IP111 do so), it will light up on an incoming call if the Visual Ringing Indication check-mark is ticked. If this check-mark is ticked the calling party number is suppressed in outgoing calls. The Settings section is basically good to adjust the following two user properties. The remaining ones (Push and Messages) should not be modified in most scenarios. A call filter imposes limits on which numbers a user can call. For example, if you want to restrict users from doing outbound calls from the PBX to the public network, you would want to disallow all numbers starting with 0 (assuming your trunk line access number is 0). This setting is much like the Call filter settings, except that it limits call forwards. So users who have intern set as Call Forward filter, will not be allowed to set a call forward to any external number except for emergency numbers. Note that this filter is evaluated when the call forward is executed, not when it is set. In your training, you always run the PBX in the so-called test mode. In this mode, all licenses whatsoever are considered available. The only drawback is that you must re-boot the PBX every 8 hours. The last step is done using the Licenses area within the templates. All licenses ticked in a template are assigned to the users for whom the template gets effective (either because it is assigned to them in UsersAdmin or because it is inherited by the assigned template). The Config User template assigns the mostly relevant licenses to its users. You can change it, but as said before, here in the training it does not matter. The other 3 steps are not covered in this book. Please refer to the innovaphone Licensing guidelines V13r1 for more details about licensing (available in various languages). We have seen how function keys are defined in a template and that they are available on all phones of all users who share this template. In addition to that it is possible to define individual function keys for users. You do that on the user's phone by pressing (for about 2 seconds) the buttons on the left and right sides of the home screen (or the little + signs on the IP232's touch screen). This brings you in to the function key editor on the phone. Function keys which have been created this way are stored as part of the user and are only available for the user. The phone's function key editor allows you to define even more types of function keys. A description of all the types can be found in function keys. An interesting possibility here is to customize template function keys for a user. Assume you have defined a Pickup key in a template then you can edit this function key on the user's phone and modify for example the group. This modification is only effective for this particular user and does not disturb the original definition in the template. Technically speaking, the settings done in the user which differ from those in the template override settings in the template, but only for this user.